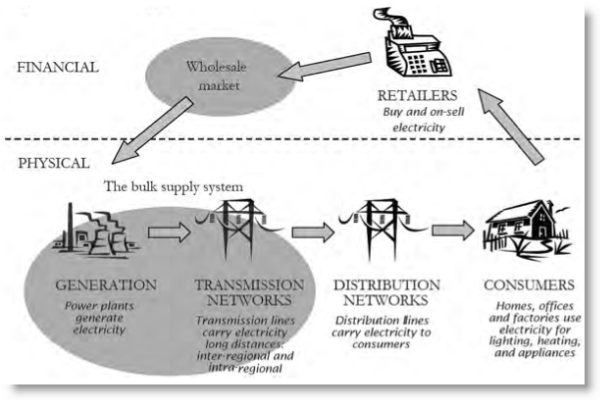 What are Electricity Retailers ? The so-called "Electricity Retailers" are NOT really Retailers ! The title is deceptive to say the least, as there charges are NOT actually associated with delivery of a product, apart from a bill. "The uptake of Independent Small Generation Units" (SGU) like Homes & Business, is becoming a disruptive force, as homes & businesses instantly have the option to become independent of the state grid, and the current type of deceptively named retailers. Peer to Peer energy generators (P2P) is a new concept, that allows the sale of private or community owned energy generators & storage sites, to sell there energy directly to the consumers and people that own or invest in the energy generator. P2P energy is a new distribution concept currently being tested in Australia. P2P providers have the potential to become the biggest disruptive force in the Australian Energy market! So, Do we need these deceptive "Retailers" ? We think not ! The Big Electricity Retailer Con ! People should understand what a Retailer is: It’s a place where you go to buy and collect items like clothes, groceries, petrol and other items like Solar panels & Batteries! Retailers are at the points of sale after manufacturers sell to Importers, then on to Wholesalers, then finally to Retailers that supply products to consumers. SGU like Home & Business are closer to being a "electricity Retailer" as they actually harvest clean energy, and many sell it back to the market for distribution! Making SGU owners smaller scale independent power Generators, with cleaner energy than any Coal fired power Generators, that are not as bad as may ill informed politicians state. Note: Any Micro Power Grids incorporated with correct sized Battery storage, offers you the option to bypass/cut-out the middle men, price increases, that in itself will dramatically reduce a System's break-even investment time! So, electricity retailers do not actually deliver you any electricity at all. As the diagram below explains (taken from a presentation by UNSW electricity expert), it shows exactly how your power comes straight from the generators via the transmission network and the distributors - So if you already have a Solar Array and exporting into the state grid, some of your neighbours will actually be getting electricity from your Solar Array, and in may cases they are paying over 300% more for your power than your feed-in rebate for connected Solar Array owners. Remember, electricity retailers simply competing for the right to send you a bill, and package up a range of tariffs that few people understand, some deceptively lock customers into a contract ...for simply sending you a bill. The simple question is: Do we need these archetypal middle-man ? Again, we believe NOT ! This question arises time & time again, because the so-called retailers have long been part of an economic model that relies on consumers buying more electricity. That means that retailers can sell more contracts, generators can build more power stations and distributors can build more poles and wires to transport the electrons, But that business model is now changing rapidly as demand is falling, energy efficiency is at a premium, more and more consumers (residential and business) are producing & consuming their own energy, and the retailers are getting in the way! One of the biggest problems for retailers is a basic one, — they aren't very good at what they do. They find it difficult to hold onto customers, as the basic price con only slows the reported “churn” rate of 25%. That means, they lost nearly one in four of their clients, and then they had to go and pay to get them back again, and then bill you for it. The true overall cost of energy cost equates to about 5% of your electricity bill, or about $150 a year, depending were you live, But that’s not the end of it. Retailers are now being accused of pocketing hundreds of millions of dollars in profits from schemes that have supported the introduction of technologies such as rooftop solar. For instance, Retailers are allowed by the "self-governed pricing regulators" (with the exception of the ACT), to charge customers $40 for each small-scale technology certificates (STC's), when the market price has rarely risen about $25. And there was about 45 million STC's washing around the system years ago. That alone has grossly inflated the cost of the schemes, and the returns to retailers, even with their carrying costs. Electricity retailers are now also picking up even more profits from the export of excess electricity back to the grid from rooftop solar systems (that don't have Battery storage) — for which they pay 6c~8c/kWh (in some cases nothing at all) and then sell it to the houses in the same street for up to five times as much! People that select to pay more & purchase so called "Green electricity" are also been fooled, as this is just another marketing ploy to make more money, as some of the Solar feed-in electricity will be actually be used by you, without you even knowing. How can the retailers do this ? Because they have managed to convince the "self governing pricing regulators" that the difference is made up with fixed grid, billing and other costs. But the solar industry knows they are profiting handsomely — hence the push for a “fair value” of solar. One thing they do achieve is loosely manage pricing risk, like banks & insurance companies, electricity retailers are very slow to pass on the benefits of falling costs, But quicker to act when prices or rates go up. So what would happen if we got rid of Retailers ? The biggest challenge would be managing the wholesale price risk — electricity is one of the biggest traded markets, bigger by a long shot than carbon, we believe just another smoke & mirrors department set up by big government. All that said and done, by you generating, storing & self-consuming your own power, you will have removed all the above issues, and that puts you in control of your power needs and true power independence !